An extended period of lower oil prices would benefit consumers but would trigger energy-security concerns by heightening reliance on a small number of low-cost producers, or risk a sharp rebound in price if investment falls short, says the International Energy Agency (IEA) in the 2015 edition of its flagship World Energy Outlook publication (WEO-2015). The report finds that the plunge in oil prices has set in motion the forces that lead the market to rebalance, via higher demand and lower growth in supply, although the adjustment mechanism in oil markets is rarely a smooth one. In the central scenario of WEO-2015, a tightening oil balance leads to a price around $80 per barrel by 2020. But WEO-2015 also examines the conditions under which prices could stay lower for much longer. Since prices at today's levels push out higher-cost sources of supply, such a scenario depends heavily on the world's lower-cost producers: reliance on Middle East oil exports eventually escalates to a level last seen in the 1970s. Such a concentration of global supply would be accompanied by elevated concerns about energy security, with Asian consumers – the final destination of a huge share of regionally-traded oil – particularly vulnerable. Developing Asia, a region in which India takes over from China as the largest source of consumption growth, is the leading demand centre for every major element of the world's energy mix in 2040 – oil, gas, coal, renewables and nuclear. By 2040, China's net oil imports are nearly five times those of the United States, while India's easily exceed those of the European Union. "It would be a grave mistake to index our attention to energy security to changes in the oil price," said IEA Executive Director Fatih Birol. "Now is not the time to relax. Quite the opposite: a period of low oil prices is the moment to reinforce our capacity to deal with future energy security threats." The report also underlines that the single largest energy demand growth story of recent decades is near its end: China's coal use reaches a plateau at close to today's levels, as its economy rebalances and overall energy demand growth slows, before declining. India – the subject of an in-depth focus in WEO-2015 – moves to centre stage in global energy, with high levels of economic growth, a large (and growing) population and low (but increasing) levels of energy use per capita all pushing energy demand to two-and-a-half-times current levels. Overall, world energy demand grows by nearly one-third between 2013 and 2040 in the central scenario of WEO-2015, with the net growth driven entirely by developing countries. The links between global economic growth, energy demand and energy-related emissions weaken: some markets (such as China) undergo structural change in their economies and others reach a saturation point in demand for energy services. All adopt more energy efficient technologies, although a prolonged period of lower oil prices could undercut this crucial pillar of the energy transition; diminished incentives and longer payback periods mean that 15% of the energy savings are lost in a low oil price scenario. Lower prices alone would not have a large impact on the deployment of renewables, but only if policymakers remain steadfast in providing the necessary market rules, policies and subsidies. In advance of the critical COP21 climate summit in Paris, there are clear signs that an energy transition is underway: renewables contributed almost half of the world's new power generation capacity in 2014 and have already become the second-largest source of electricity (after coal). The coverage of mandatory energy efficiency regulation has expanded to more than one-quarter of global energy consumption. The climate pledges submitted in advance of COP21 are rich in commitments on renewables and energy efficiency, and this is reflected in the WEO-2015 finding that renewables are set to become the leading source of new energy supply from now to 2040. Their deployment grows worldwide, with a strong concentration in the power sector where renewables overtake coal as the largest source of electricity generation by the early-2030s. Renewables-based generation reaches 50% in the EU by 2040, around 30% in China and Japan, and above 25% in the United States and India. The net result of the changes seen in the WEO-2015central scenario is that the growth in energy-related emissions slows dramatically, but the emissions trajectory implies a long-term temperature increase of 2.7 °C by 2100. A major course correction is still required to achieve the world's agreed climate goal. "As the largest source of global greenhouse-gas emissions, the energy sector must be at the heart of global action to tackle climate change," said Dr. Birol. "World leaders meeting in Paris must set a clear direction for the accelerated transformation of the global energy sector. The IEA stands ready to support the implementation of an agreement reached in Paris with all of the instruments at our disposal, to track progress, promote better policies and support the technology innovation that can fulfil the world's hopes for a safe and sustainable energy future." 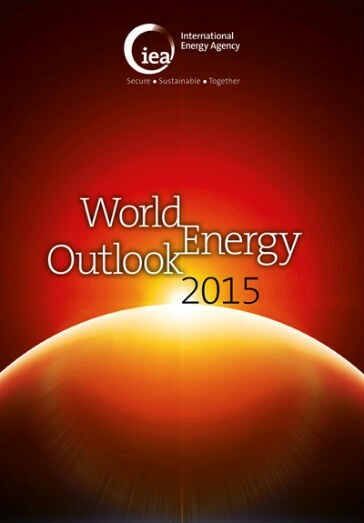 World Energy Outlook 2015 is available for sale at the IEA Bookshop.